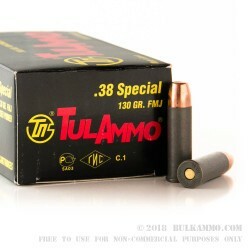 TulAmmo .38 Special 130 grain Full metal jacket ammunition with a steel case in a 1000 round case load is a bargain ammunition that satisfies the mainstream need for .38 special ammunition at a reasonable price. It’s simple, with reliable ignition and works in most firearms chambered for the .38 Special or as practice rounds in the .357 Magnum chambered firearms too. Note: the Steel case will require a relatively clean firearm to avoid some of the sticking and case expansion hat is common to steel casings, especially when shot out of a revolver. Clearly, being a revolver based cartridge, these .38 special rounds will need a clean gun and a small amount of attention to detail as you shoot. They aren’t perfect, but when you compare them to the much higher prices of the competitors for the same load, they just make sense. 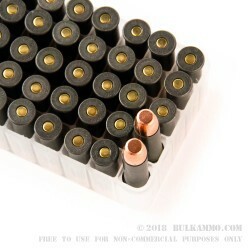 The above disclaimer doesn’t discount the bargain benefits of steal cased ammunition if you are arriving at the range with a mainstream gun that’s clean, and you know what to expect. It is not easily reloadable, but the ignition on the rounds is incredibly reliable and the cost to shoot is significantly reduced compared to other brass cased cartridges. This ammunition is excellent for range practicing and when used in guns that are not built to match tolerances. The same specifications are applied to any steel cartridge ammunition, especially when shot out of a revolver where there is not a forceful extraction process, and where fouling can add up in the chamber or cylinder areas.